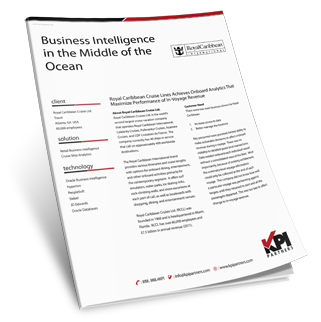 Royal Caribbean Case Study: Business Intelligence in the Middle of the Ocean. Royal Caribbean is one of the largest cruise ship companies in the world with 20 ships with a total capacity of over 50,000 passengers, including the world’s largest cruise ship, Oasis of the Sea. In 2009, Royal Caribbean will visit 251 ports, in 76 countries, on 6 continents. Royal Caribbean had 2008 revenue of $5.8 billion and over 49,000 employees. Carnival is a global cruise company and one of the largest vacation companies in the world. Their portfolio of leading cruise brands includes Carnival Cruise Lines, Holland America Line, Princess Cruises and Seabourn in North America; P&O Cruises (UK), and Cunard in the United Kingdom; AIDA Cruises in Germany; Costa Cruises in Southern Europe; Iberocruceros in Spain; and P&O Cruises (Australia) in Australia.